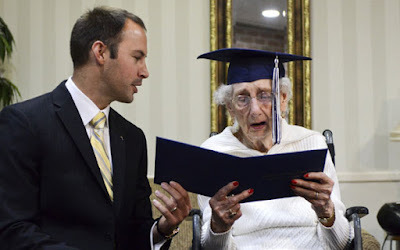 Catholic Central High School had decided to confer a honorary diploma to 97 year old woman in USA. The woman, Margaret Thome Bekema studied in the school in 1936 but was forced to drop put to take care of her sick mother. However the woman always wanted a high school diploma and her family contacted the school and shared her story over the Summer. The school management had decided to confer a honorary diploma to her. Bekema received honorary diploma in front of her friends and family at Yorkshire and Stonebridge Manor senior community on October 29 and she burst in to tears as people clapped joyfully as she received it. Bekema after her drop out, has done clerical work for the armed forces and also served as a preschool teacher.